20ft Dia. Mega Bol a real attention getter. 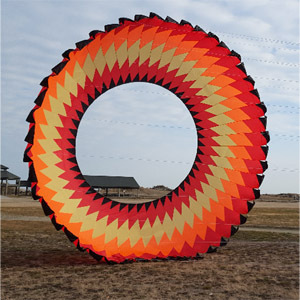 The Bol is recommended for experience kiters only. 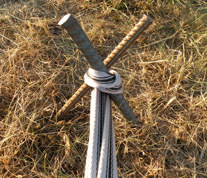 Advance tie down system is required. Includes, pull string sruff bag with carrying strap. Symmetrical swivel crafted entirely from high-strength aluminum. The Black Diamond Rotor swivel is mounted on an enclosed bearing that is silky smooth and each end will hold up to three biners. 5600 lb Max Load (26kn). Lead line or tether line and tie down system not included. Recommended 20 to 40 ft 1100 lb or higher. The longer the lead line or tether the higher the bol will rise. Less than 20 ft on the 20 ft bol is not recommended. Two 4 ft rebarb rods. Two carabiners oval 23 kn. (Omega Pacific ISO Oval Carabiners). 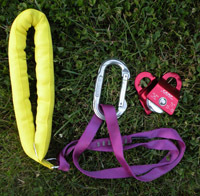 One set at the tie down strap connects to the lead line, the other carabiner connects the leadline to the Black Diamond Swivel. Always tie down to a solid stationary object the pull on the bol can exceed 700 lbs. Do not connect the bol to the tie down system until it is properly anchored. If you are using the rebarbs (min. 4 ft on grass), be sure you angle the bars in the ground and create and X and the tie down strap leads out the bottom of the X toward the bol. Be sure to unloop the bridle line, it is single line looped for storage only. 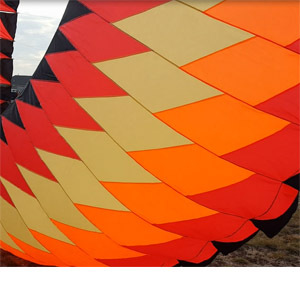 After the bol is properly anchored and attached to the tie down system, simply walk to the back of the bol (facing the wind) pick up the trailing edge and close the gap so the bol collects the wind as it fills leave go and step back. Grab all bridle lines at the swivel and walk toward the bol. Some use their arm, others who don't desire line burns use a strap and still another method is with a carabiner. This sounds easy but at the higher wind levels the bol is climbing and dropping and generating considerable pull. We recommend you always fly with a partner. The carabiner with two padded straps attached seems to be the best method, place the carabiner over the bridle lines at the Black Diamond Swivel. You and your partner may now walk quickly toward the sail, the bol will collapse. 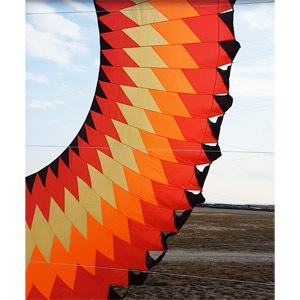 Shown on the right is a large kite walk down system with a pulley. We use this set up (without the pulley) to collapse bols 13 ft and up. It is easy to setup and easy to use. 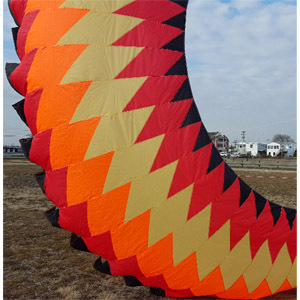 We also add an additional extension strap and padded strap and use it to take down bols by slipping the carabiner over the bridle line and two people can walk the carabiner toward the sail and collapse the bol. The extended strap is ideal to help control the lift on the bol during walk down. Always store your bol dry and free of sand or grass. It is recommended you daisy chain the bridle line the same way it was received and leave one of the carabiners attached to the swivel to lock your daisy chain. If these lines get twisted and tangled, you will spend the better part of a day untangling. Keep out of reach of children, and parents who send their children close to take pictures. We have got into a habit of caution tape in the flying area. 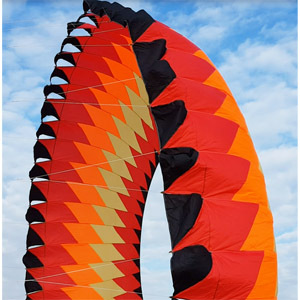 Do not fly in high winds or gusty conditions. Do not fly over 15 mph wind, near power lines and trees. Use caution when launching and take down. Always fly with a flying partner.